Love it or hate it, Facebook just released new features for its Messenger app and is now dubbing it the Messenger Platform. With the new platform, developers can make apps that utilize GIFs, photos, videos, audio clips and whatever else they think makes communicating more expressive and creative for Android and iOS devices. There are 40 apps and counting you can download right now to use with Messenger that have "optimized flow" - which just means they'll show up directly inside the Facebook app and can be found via the More tab (the three dots found on the bottom right of the app). If you don't already have the app installed, you'll have to head over to the app store and download it. Facebook has made the process easier by allowing direct downloads through Messenger - if your friend is using Giphy and you want it too, there will be a "Reply" link in your message giving you the option to install it or simply quickly respond with the app. Not all the apps will have this feature though. Facebook will be screening every submitted app to approve it for the Reply links and the More button. Want that app? Hit reply! You won't be able to use all the apps with Messenger immediately but the update should start rolling out today. There are also apps that are only available on iPhone 5, iPhone 6 or the iPhone 6 Plus. Most Android devices with 4.0 and up should work. 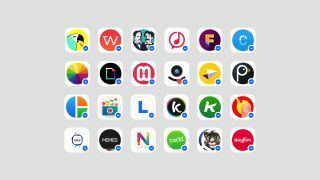 In the meantime, here are five apps we've enjoyed so far that are completely ready for Facebook Messenger Platform. Ultratext is a pretty fun way to send text messages in GIF form but all the really cool stuff requires spending a few bucks here and there. Demoed during the F8 (Facebook Developer's Conference), Giphy is bringing everyone's favorite GIFs to Messenger. Pick your favorite GIF then hit the share button to send it off to your friends. So far, it doesn't seem like this app is widely available yet. Want to replace your face with a sticker? Then use Stickered in Messenger for another way to send photos. It already has some familiar stickers found on Facebook and it's completely free. The only downside? Pusheen cat is nowhere to be found. It seems Facebook loves stickers. Emu is another sticker app that's ready for Messenger right now. Take a selfie of yourself and go nuts decorating with the various packs the app offers before sending it to all your friends. Placing your images with animated overlays - basically another GIF app - is what PingTank promises to do. Other apps on the list seem to do a slightly better job, but the Messenger integration hasn't shown up when we tried to use them.